The results of the rally are available on the ERA site. 107 cars started and 10 retired. There were two classes Vintageant pre 1941 and Classic 1941 - 1977. There were also - though it doesn't say so on the ERA site two classes of crew. One categorised the difference as between the ardent rallyers and the gentlemen tourers. I'm not sure about the soubriquet 'gentlemen tourers' but you get the general idea: some were there to win and some were there only, or primarily, to arrive in Paris. 'slowest' time was 456 hours - though slowest is not quite the right term because the times include penalties for time spent broken down. (In fact the whole scoring system was a mystery to us novices - though as you can see, and as we intuited, it scarcely mattered once you'd lost 10 hours or more. In the Classic - 1941-1974 - (57 starters, 55 recorded finishers) the winning time was 260 hours 41 minutes and the next 23 cars were within 10 hours. For a rally timed over some 30 days programmed for driving 8-10 hours each day with up to 6 time trials, it's seriously competitive at the top. The tourer attitude was very different. There wasn't a need to do every time trial; the ERA route was a starting point but to be compared with the alternative routes - for example those from TomTom or Google Maps. The benefits of early arrival at the next stop were not to be ignored: a balanced view of the attractions of an easier and/or shorter route were considered. And sometimes there were striking differences: Smolensk to Minsk is 3-4 hours on the fast road (allowing for a lunch time arrival and an easy afternoon) whereas the ERA route was 5-6 hours longer. The Tourers arrived in St Moritz in the early afternoon - in time for tea! The tourers weren't all there by choice. Some, perhaps most, became tourers of necessity when their cars suffered serious damage in Mongolia 'the rolling wounded'. A few, including me, were candidate tourers from the outset: the challenge was survival and enjoyment not victory. No matter: as we progressed, and especially once we reached Europe, the tourers were a sizeable group - 20 crews on some stages and another 15-20 deviating on an ad hoc basis. And one event crystallised the difference. Car 21, a 1933 Rolls Royce Phantom II suffered a fire in Mongolia and had to return to Ulaan Bataar for rebuilding. Having missed several days, the crew drove 12 hours a day, camping by the road side at night to catch up in Russia. After missing a week or more, they were definitely tourers and as the rally looped north of Moscow they decided on an excursion. They drove into Moscow and persuaded a policeman to let them park for a photo in Red Square. My reaction was to applaud: what imagination, what ingenuity! But when I said so next evening at dinner, the reaction of my fellow diners was nuanced to say the least. Yes, Hok Kiang Sia had shown initiative but our task was to follow the rally route: we had bought in and we should follow the rules. There was the half articulated threat of club law: if you don't want to play by the rules, you shouldn't be here. So there's the rub. On the one hand the ERA encourages participants to believe that it will do all it reasonably can to help cars reach Paris. On the other, if your car is damaged that help will be limited. I discussed this with a senior ERA man (a former Clerk of the Course making a guest appearance) who was surprised that a tourer route wasn't available especially in the later stages: he said it had been done before. The recent history of the Peking to Paris is as an event where fragile older cars comprised the majority of entrants but the trend has been for their numbers to decline. Until 2016, the Vintageant class of pre-1941 cars was in the majority but in 2016, the ardent rallyers in Classic cars comprised over 50%. The trend is clear and I expect the Vintageant numbers to decline further in 2019. But seeing the enthusiasm of spectators for older cars, that will be a loss to all. We are already at roughly the half way point in the fund raising and I want to thank all those who have contributed. I value each and every contribution and I have or will thank each of you personally. A few have contributed anonymously and I respect their wish not to be identified publicly but I'd be very pleased if they would let me know privately who they are so that I can thank them too. Alongside the rally, I've been seeking to raise funds for a research project at the University of Leicester Medical School. 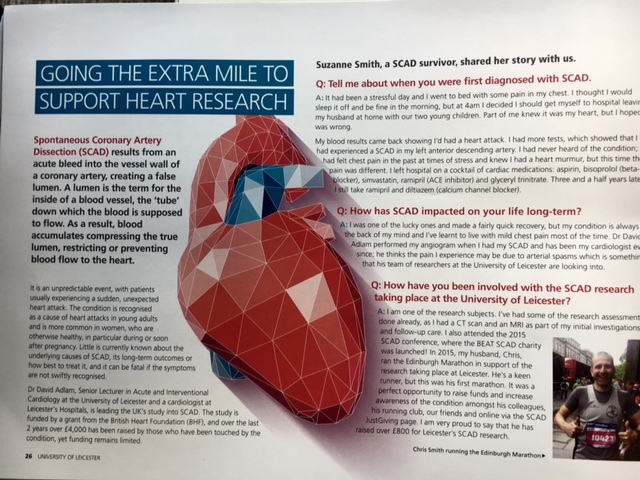 The work on Sudden Coronary Arterial Dissection (SCAD) addresses a heart condition suffered mostly by young women during or shortly after pregnancy. I enclose with this post some relevant notes from the University. Remember going down a country lane until the tarmac ran out and picking your way across deep ruts, or perhaps going with the ruts and wincing as the car bottomed? And when you completed the 200 metres to the farmhouse or picnic spot or whatever, you heaved a sigh of relief - with just the slightest niggle that the return might be your undoing. Now imagine doing that for 300 kilometres with an allocation of, say, 8 hours to do it. The average speed doesn't sound so bad - less than 40 kph / 25 mph. And you get some help because you've fitted a steel plate underneath the front of the car to protect the sump and vital parts. There's a track.... It's brutal: - the terrain is unforgiving: there's a track - often 100 metres wide with perhaps 6 or 8 'lanes' each of them rutted, littered with potholes, and as often as not, with corrugations, hard ridges across the line of travel, like mini-humps that shake the car and its contents (counterintuitively corrugations are often best taken faster - provided there aren't too many potholes). In this peculiar world stoney areas are almost welcome - more likely to puncture tyres than break an axle! And there are the specials - sand drifts (got caught in one of those and had to be towed out) and flooded (supposedly dry) rivers - needed towing there too! The car shakes and rattles. The bottom grounds. The wheels hit potholes awkwardly. The balance of probability at any moment is that the car will fail and then you'll be in the middle of nowhere relying on the satellite phone to call for help. It's brutal on the crew too: the driver has to give full and sustained concentration to make the least bad of the track - 8 and more hours of that is no fun - and the navigator is guiding by heading as best the zigzagging tracks will allow towards a point in the desert/steppe distinguished only as a compass point (waypoint) recognised by a Garmin - a modified GPS system. (And to be followed by putting up a tent and car maintenance.) I did a non-scientific study of car casualties over the period in Mongolia with results as follows: a. immediate serious and car stopping damage: 20% - usually requiring a low loader b. material damage to normal function either immediate or leading to later weakness 80% (for example our starter motor began sticking and had to be stripped down later in Novosibirsk - great nuisance getting jump starts etc and worry about conking out during day. Emerald still carries tears in the metal fabric of the body. c. Minor scratches and abrasions or nothing: 0% - lucky bastards - keeping quiet with reason. It's a minor miracle that Emerald stood up as well as she did. But I'm still wondering at the utility of it. 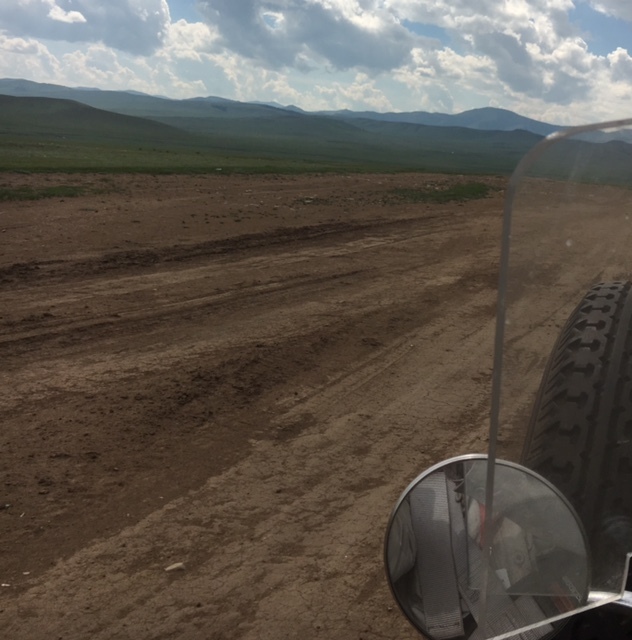 Two days in the Gobi would have been interesting,challenging, scary and sufficient for me. 6 days more (8 if you count two equally challenging days I n adjacent Russia) was gratuitous violence and I'm not sure that the "satisfaction of achieving survival" really cuts it. We finished in blazing sunshine in the Place Vendome. The square was thronged with reunited families celebrating the arrivals. The sponsors stepped up to the mark by providing a free champagne tent. The first cars - led by the winners - arrived at 1.15: the last some two hours later. By 4.30, it was almost all over - a few sightseers picked their way round the cars now deserted by their crews. At 7.00 everyone reassembled for the celebratory dinner. The plea to be in our seats by 7.30 achieved only after 8. A slide show seemed to include at least one shot of each participant and was followed by a video with a similar objective. Skilful presentation gave a positive spin and some of the shots showed breathtakingly beautiful scenery. But how can you show the jolting of the corrugations or the heart stopping shudder after grounding on a particularly deep pothole? Damaged cars weren't ignored but the balance of the presentation has begun the process of rose tinting the negative moments. The memories will be dominated by the positive. The award giving was extensive with everyone who finished getting their moment in the spotlight. And it's true that we are winners from the experience whatever the official designation of our achievement. The dinner finished at 12. The bar finished at 2. The reflection and conclusion process is only just beginning. The pictures tell the story. We managed to get about 150 kms north of Lausanne before we ran out of road. The engine was making rattle noises at higher revs from the outset. At first we were able to do 60-65 kph with controlled rattling; then 55-60; then 50-55 and then we decided we needed to do something. So we consulted various authorities about isolating one of the cylinders and running on only 5. Worked brilliantly for 500 metres then the coil blew. So we fitted the spare coil and it lasted for 5kms. We didn't know (and were not told) that we had to earth the idle spark plug. 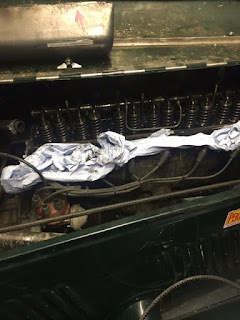 So the second coil blew and we weren't going anywhere. Only ourselves to blame. And we borrowed a coil from the friend of a local enthusiast who stopped to help. So we can move the car a bit (we think): four cheers for the local enthusiasts. He wouldn't take payment but he wants his coil back - and he shall have it. Will we make it to Paris tomorrow? Yes we will. Will Emerald be with us? Let's hope so. It was cold and wet on the passes. Not much fun at all. By 12.00 I was wishing that it had been possible to put the car on a low loader and proceed by train - the Glacier Express looked cool; but that was just dreams. Emerald had to work really hard to get up to and through the passes which were over 2,000 metres high. The approach to each comprised a series of hairpin bends extending over several kilometres. The descents weren't much better - steep roadways into tight bends so that the drum brakes had to be supported by putting the engine into low gear to aid speed reduction. By the time Emerald reached Lausanne, there were various rattles and squeals as the car accelerated and decelerated. It was clear that Emerald needed expert attention. A cluster of mechanics gathered to view the valves, pistons and other moving parts of the engine. The consensus was that the dominant problem was the alternator - our spare had been fitted in Aya, remounted in Novosibirsk, and repaired on the road in Slovenia. Now the casing had cracked and the rotor carrying the fan belt was failing. So we refitted our original - accused and replaced in Aya but never proven to have failed. Fitting was quick and the new (ie old) alternator provided good charge. 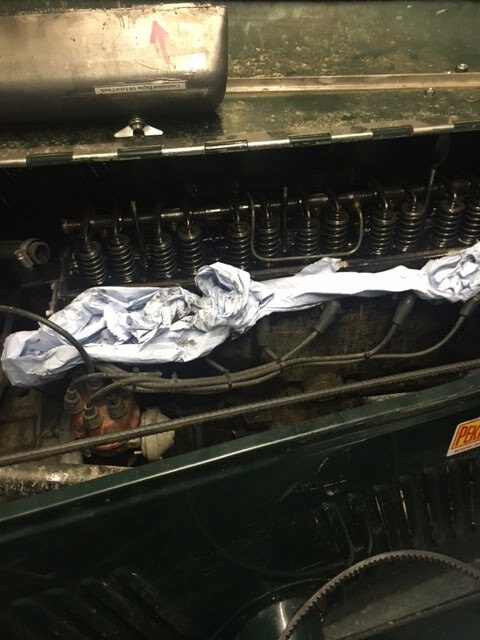 The engine was revved and the repair was passed as the solution. But below the good noises was a faint rattle that was reminiscent of the big end bearing failure that caused our breakdown in Russia. Perhaps the work done in Omsk was being undone by the wear and tear since and exacerbated by the stress of alpine driving. It wasn't the same noise, we were told, but we were advised to take it easy. A full repair would take at least a couple of days we didn't have. The current status quo would probably be all right for the last two days. So we agreed to stick so far as possible to Autoroutes and to drive the car gently. We set out tomorrow with the warnings ringing in our ears and with hope that we haven't done too much damage. Tulip maps are the preferred method for rally organisers to tell participants how to get from a to b. We were issued in Beijing with two thick books for our journey. These are pages from the 12 pages of detailed tulip instructions about how to travel from St Moritz to Lausanne.